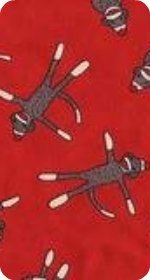 Sock monkey fabric - if you're looking for sock monkey prints, you've got it! Fun, bright, and ever so sock monkey-ish prints, suitable for curtains, cushions, bedding, and many other monkey sewing projects. Cute sock monkeys can be found printed on snugly flannel (fleece) and cool cotton. There are many designs available. So, whether you are making a quilt, nightcap, lamp, banana case or what ever monkey orientated item it may be, I hope you find the sock monkey fabric you are looking for. I personally have made things both both fleece and cotton fabric and find both are fun to work with. I get my fabric from Fabric.com and have found them to be very reliable and their selection of sock monkey fabric great. 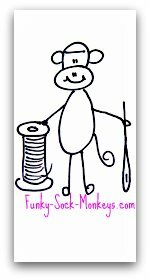 Sock monkey material is available in an endless supply of colors; pink, orange, red, blue, brown, white, cream to name a few. There are kids monkey pattern fabrics with bananas, numbers, monkey faces, circles, pogo sticks, geometric shapes, tropical beach scenes, heather print, goodnight monkey fabric and so, so many more. A super simple item to sew is a small tote bag to carry your sock monkey in. It's simple! Step one: Cut outtwo rectangles or squares (big enough to fit your monkey or what ever you want to put in it). Step Two: Along what will be the top edge of your tote bag, fold material over about 2cm (the folded material will and up being on the inside of your finished bag) and sew along the top to create a nice neat edge. Step Three: Put the two right sides together and then sew along one of the sides, along the bottom and then up the other side. Step Four: Turn the bag right side out. Step Five: Cut out a strap. Cut a strip of material long enough and wide enough to suit your bag. Remember to make it a little longer to accommodate part of the strap sitting inside the bag and stitching it on. Width wise make it a little wider if you want to sew any seams on either side or make it extra wide and turn the wrong sides together and sew right along the length of the strap, close to the edges, so it looks like a long sausage and then turn it right side out and attach it to the bag.